Every so often, I stumble across something completely and totally unexpected at Eilean Donan and today I have a real wee gem of a find to share with you all! An exclusive preview that you can have a look at before ANYONE else! Tucked away in the back of a dusty drawer in the castle we recently discovered a small blue nondescript cardboard wallet with the words ” LIZARS Developing & Printing Services“. Upon opening, we duly discovered around 60 old photographs from what I believe to be approximately the very late 1920’s and early 30s depicting scenes of the castle’s reconstruction! Although they have started to fade a little, I’ve had them professionally scanned in order to preserve them, and can now share them with the world. The reconstruction took about 20 years in total, partly due to World War I happening right in the middle of it. When you see some of the construction methods that were used back then, you also get a sense of why the project took so long. There’s also one or two images of Farquar MacRae, the legendary Clerk of Works of the whole project, who lived on the island in a small hut for much of the construction period, but who sadly died only 6 months before its completion. There’s also a glimpse of Lt Col John MacRae-Gilstrap and his wife Isabella, along with a local shot or two of what is now known as the Loch Duich Hotel. The final 5 photos are from the grand opening day in 1932 when the Lt Col led the Clan MacRae and the local community on a march to the castle. Anyway, enough from me, here are the photos and I hope you enjoy this little treasure trove! I’ve frequently been asked to provide a little more historical detail on Eilean Donan here on the blog, and whilst I appreciate that some of you may not have a huge amount of interest in the multitude of facts and dates that encompass the castle, I do have to try and provide a little more background for those that are. I hope you find the following abridged detail of some use. By the 6th century the Broch of Eilean Donan became the monastic cell of an Irish Saint called Donan who was a contemporary of Columba in the time of the fledgling Christian faith in the Inner Hebrides. Bishop Donan has lent his name to the castle for Eilean Donan in the Gaelic tongue simply means “Island of Donan”. However many ancient legends surround the origin of the castle’s name and in Gaelic folklore the fabulous King of the Otters in his silver coat is buried under the castle. The Gaelic name for otter is Cu Don or “brown dog” hence Eilean Donan may be “The Island of Otters” and even to this day otters are seen at the castle. In the 8th century the Norse Viking swept down from the North to colonise all the islands off the West Coast of Scotland and for four centuries this was a Viking land as many of our local place names yet testify. However Scotland’s monarchy residing in the Clyde basin sought to extent their reach and arrest control of Viking territories such as the Hebrides. In 1220 King Alexander II’s campaign against the Vikings saw Eilean Donan constructed as the most northern sentinel of his empire, stamping royal authority in the strategic confluence of Lochalsh, Loch Duich and Loch Long. Alexander did not live to see the expulsion of the Vikings and his son Alexander III would be left to face the wrath of Viking King Haakon Haakonson. Haakon’s fleet crossed the North Sea in the summer of 1263 bound for war with Alexander. 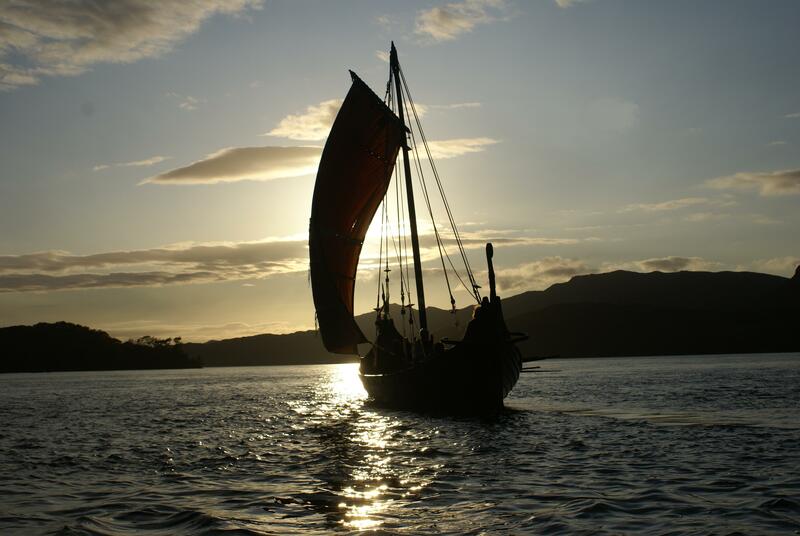 A total eclipse of the sun heralds doom for the Vikings and they drop anchor in Broadford Bay. From the watch tower of Eilean Donan, Haakon’s fleet were to be observed sailing through Kyleakin still bearing a Gaelic name meaning “The Straights of King Haakon”. Haakon’s fleet sailed south for battle against King Alexander at the battle of Largs. Dreadful storms win the day for Alexander at Largs and the Western Isles are his with Haakon’s passing. Alongside King Alexander at Largs is a trusted lieutenant by the name of Calean Fitzgerald whose distinguished service in battle earns him the reward of Constable of Eilean Donan from a grateful King. Calean Fitzgerald consolidates his position of power in Kintail by marrying the local Matheson Chief’s daughter. Their first-born son is Coinneach or Kenneth. In Gaelic the name MacKenzie mean “Sons of Kenneth”. The MacKenzies grew in power and status, and Eilean Donan became their Western fortress. But they attain many castles and by tradition Eilean Donan was governed by proxy for them by their hereditary bodyguards, the House of MacRae. Thus the MacRaes become known as “The Mackenzies Coat of Mail” and hold Eilean Donan Castle throughout this turbulent mediaeval period. Eilean Donan is a very typical mediaeval Gaelic Tower House of the time of the great marine warlords of the Gaelic West Highland archipelago known as “The Lords of the Isles”. These kings of a marine empire ruled by Birlinn (a Scottish longboat) and claymore, and Eilean Donan Castle saw its share of conflicts during this time. In 1539 Donald MacDonald of Sleat attacked Eilean Donan Castle with 50 Birlinn challenging the authority of King James V in his quest for the Lordship. Famously his attack is foiled by one Duncan MacRae who is fortunate to mortally wound Donald with his last arrow. The arrow hole from which Duncan shot his last arrow can still be seen today on the wall of the Great Well. In the mid 17th century even Cromwell’s forces took the castle and held Kintail in a brutal grip. Such were their demands for food and fuel from the MacRaes of Inverinate that the Castle’s garrison incurred the wrath of the clan, and their leader, a Campbell, was cut in half by a claymore wielding MacRae. 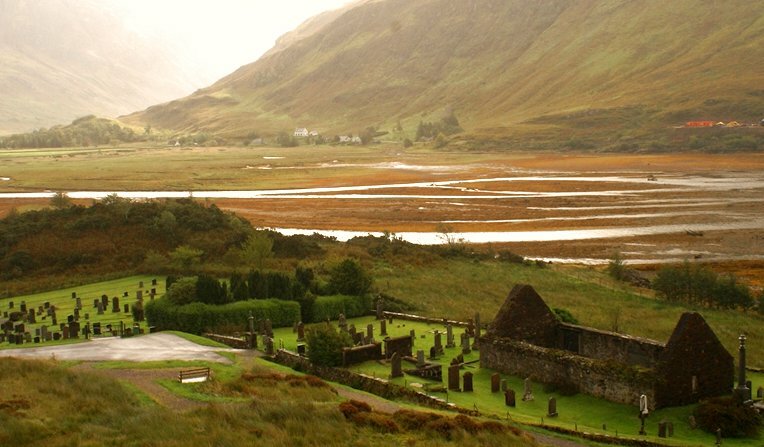 The clansmen of Kintail were loyal to King James known as Jacobus in Latin and the King’s supporters were thus known as Jacobites. In 1715 the Jacobite clansmen of Kintail captured Eilean Donan for the King and gathered here before setting off south for Sheriffmuir in support of the Earl of Marr for King James against The Duke of Argyle for King George 1st. There is a magnificent painting commemorating the event on the walls of the Banqueting Hall. 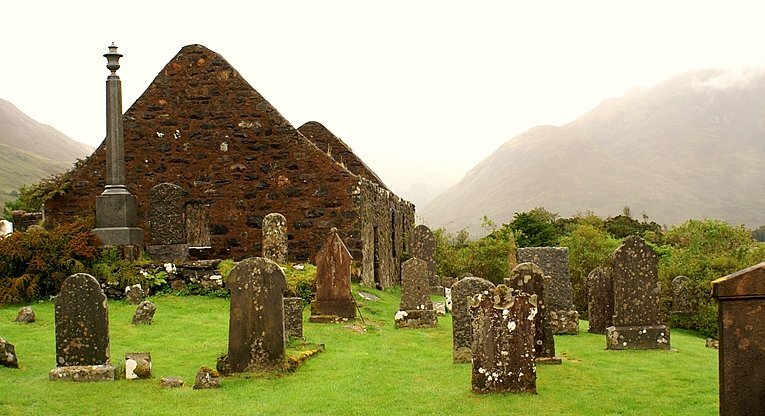 Legend tells that the MacRaes were cut down in the heart of the battle and Kintail would suffer 58 widows after that battle. Yet support for the exiled House of Stuart remained strong in Kintail and Eilean Donan Castle would yet again be the focus for 1719 Jacobite Uprising. In 1719 Spain and England were at war for the control of global maritime supremacy. Spain saw the Gaelic Highlander and the Jacobites as a potential way to topple George of Hanover from the throne and defeat English plans. Two Spanish forces were sent to illicit Jacobite support. The first small expeditionary force was sent to the Highlands with Earl Marshal Keith and Tullibardine who were to instigate a Jacobite Uprising amongst the Highland clans. Their base was to be Eilean Donan. The second larger force was to invade England. But fate played an indiscriminate hand and a dreadful storm destroyed the main Spanish fleet as the rounded Cape Finistair and entered the Bay of Biscay. With known Spanish allies attacking the Hanoverians to the South the Jacobites were not vulnerable and exposed in the Highlands and sure enough the Hanoverians turned their attentions North. On the 10th of May three Hanoverian frigates arrived at Lochalsh. The Enterprise, the Flamborough, and the Worcester. They found Eilean Donan Castle garrisoned by about 30 Spanish soldiers and a small band of Jacobites who were not prepared to surrender. The Government warships began to bombard Eilean Donan Castle with cannon. This was the last castle in the British Isles to be so bombarded. The Government had superior numbers and firepower eventually sending boarding parties ashore to force a surrender. With the capture of Eilean Donan Captain Herdman of the Enterprise orders that the repositories of Spanish gunpowder be set afire, and so Eilean Donan Castle was reduced to a ruin in a series of terrible explosions. A month later at the Pass of Glenshiel the Jacobites and their Spanish allies fought General Wightman’s Redcoats. The battle ended with the Highlanders melting away over the Five Sisters of Kintail and the Spanish surrendering to the Government. With the destruction of Eilean Donan Castle, and Kintail daunted by the Redcoats the castle became a picturesque ruin over the next century. But after almost 200 years had elapsed the castle saw a most unlikely rebirth……. Lieutenant Colonel John MacRae had grown up fuelled with his father’s tales of his illustrious MacRae clan ancestors and their home of Eilean Donan. Lieutenant Colonel MacRae had married an English heiress from the Lincolnshire town of Newark. Her name was Isabella Mary Gilstrap known to all as Ella. A condition of her inheritance required Lieutenant Colonel John MacRae to adopt her surname and so they became the MacRae Gilstrap family. 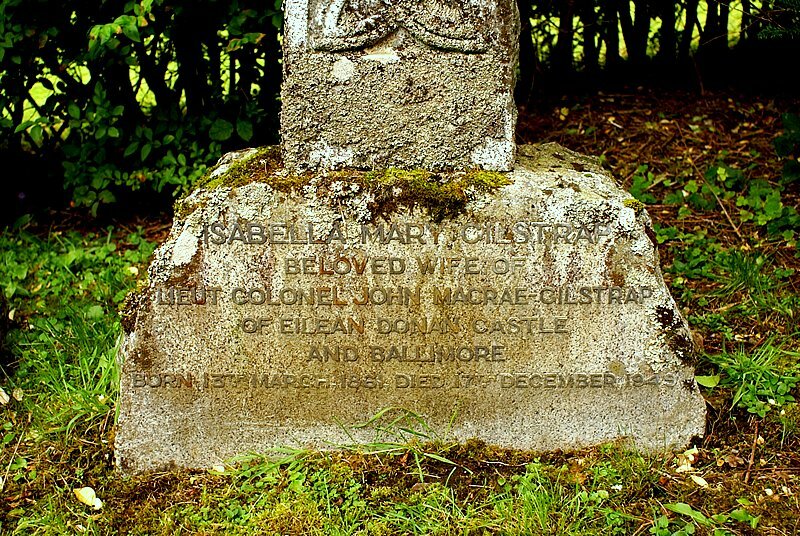 The MacRae Gilstrap family thus bought the ruin of Eilean Donan in 1911 and there they raised the clan MacRae banner for the first time in centuries. Now by serendipitous good fortune Lieutenant Colonel John MacRae Gilstrap and Ella met a local stonemason and wood carver called Farquhar MacRae who was hired to consolidate the remains of the castle. However the decision was taken to restore the castle and the MacRae Gilstrap family hired an Edinburgh firm of architects to draw up construction plans, and for Farquhar to be made Clerk of Works. Farquhar laboured over the next 20 years on the castle eventually earning the Gaelic nickname Fearachar a’ Chastiall or Farquhar of the Castle. Sadly, he died in 1932 a mere six months before the castle was completed and never saw the completed article. A bronze plaque in the courtyard with the MacRae badge of Fir Club Moss and the legend Fearachar a’ Chastiall 1912 –1932 commemorates his life. However the castle returned to her former glory and is a fitting tribute to his dedication and skill. The MacRae Gilstrap family had a grand opening and march of the clan to the castle in 1932. It became their regular summer home before the war. Lieutenant Colonel John MacRae Gilstrap died in 1936 and Ella survived him until 1949. Eilean Donan Castle then passed to their son Duncan, who became the new constable of the castle. 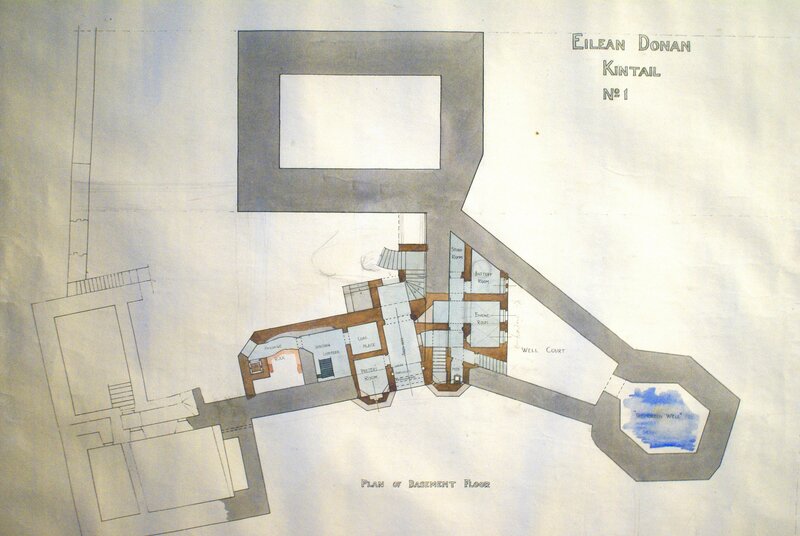 In the 1950s Eilean Donan was perhaps only known to a few intrepid adventurers to the West Highland coast. 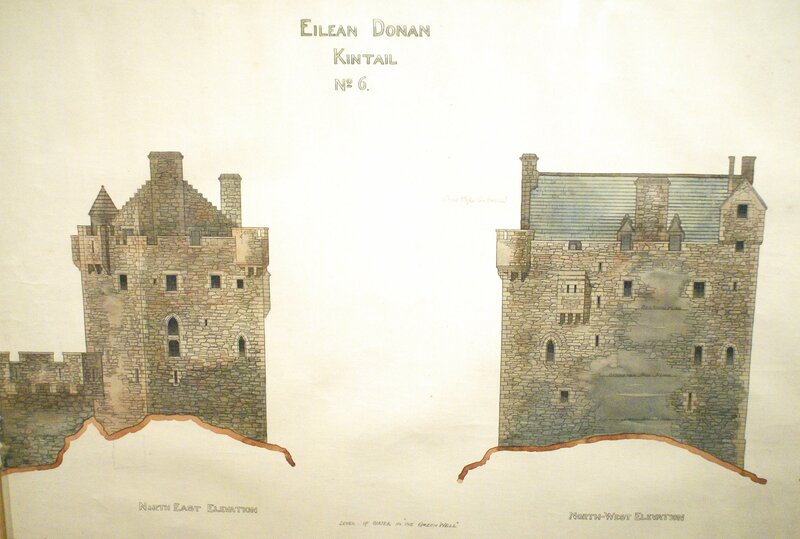 However a spate of Hollywood movies in the 50s featuring the castle such as Bonnie Price Charlie, Prince Valiant, and most importantly The Master of Ballentrae made Eilean Donan a familiar image. Its reputation as an idyllic and picturesque castle grows, as it perhaps typified the popular image of a Gaelic West Highland Tower House, and television helps to spread the image too. In 1966 Duncan MacRae dies and the Castle passes to the late Johnny MacRae, father of the current head of the Trust, Baroness Miranda Van Lynden. By the end of the 1960s the new road network made Eilean Donan much more accessible and the numbers of visitors increased geometrically. Eilean Donan Castle is now one of the most famous castles in the world and it is the iconic shorthand image for Scotland itself, attracting over 300,000 visitors per annum. Yet the castle is more than a tourist Mecca for it remains the private family home of the MacRaes who are the direct descendants of John and Ella. It is also the home of the Clan MacRae Society and a regular venue for clan events. 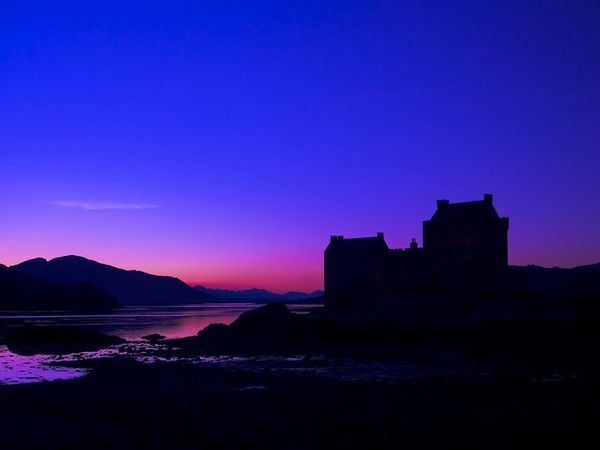 Eilean Donan is a much loved Scottish icon, but without the passion, commitment and vision of Lt. Col John MacRae Gilstrap and his wife Isabella, todays castle just simply wouldn’t exist. Over the years, quite literally millions of people have enjoyed exploring its walls and ramparts. Additionally, hundreds of local people have been reliant on the vital employment it has offered through the decades. I often wonder whether John could ever have anticipated how in years to come Eilean Donan would win a place in so many peoples hearts, or the important role it would now play in the local community. From time to time I visit his graveside at Clachan Duich, just to pay my respects. I took a wander down yesterday, amidst the rain and the melancholy drizzle and was reminded how beautiful little places can often be over-looked. Nestling in the shadows of the Five Sisters of Kintail, at the point where the River Crow meets Loch Duich, sits the ancient resting place of the Clan MacRae; Clachan Duich . 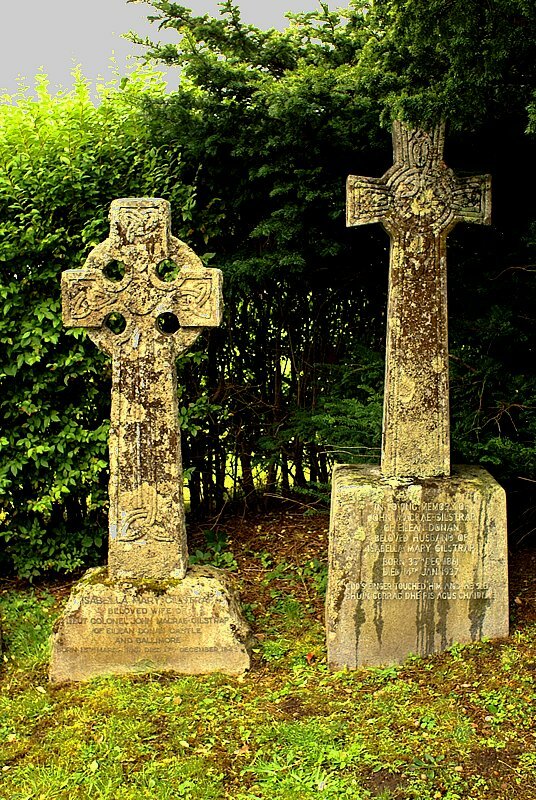 This beautifully situated burial ground is absolutely steeped in history and folklore dating back to around the 8th Century, and it is here that John and Isabella lie. If you’re at all interested in Clan MacRae or John and Isabella, it is well worth a small diversion off the main road to Eilean Donan just before you reach Inverinate. Although the entire place is of great interest; located in the centre of the cemetry you will find a small area enclosed by a stout hedge, and this is where you discover the final resting place of John and Isabella. As is befitting, they lie beside each other, with other family members, including their only son Duncan close by. 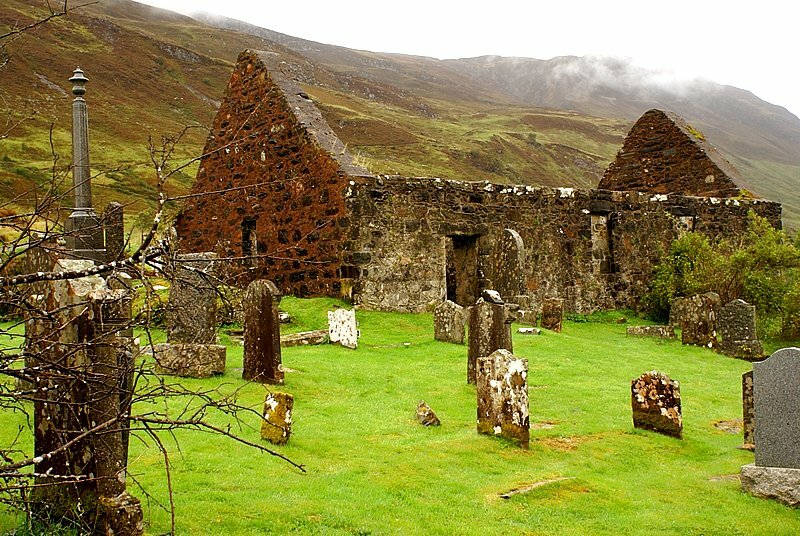 The old church itself was destroyed by the same warships that were responsible for the destruction of Eilean Donan back in 1719, but contains fascinating memorial plaques detailing important moments and events in the Clan’s history. It was originally dedicated to St Duthac in 1050 AD, though the site was in use some centuries earlier. Surrounded on all sides by the majestic hills of Kintail, the peace and tranquility of the place makes it easy to understand why it was chosen for its purpose. The sweet scent of the wild bog myrtle just adds to the calm atmosphere, and I can think of no better place for John and Isabella to rest. There are certain items within the castle that most visitors barely give a second glance to. One of those items, and certainly one of the oldest in the entire castle, is the castle “Yett” which now hangs in the Banqueting Hall. 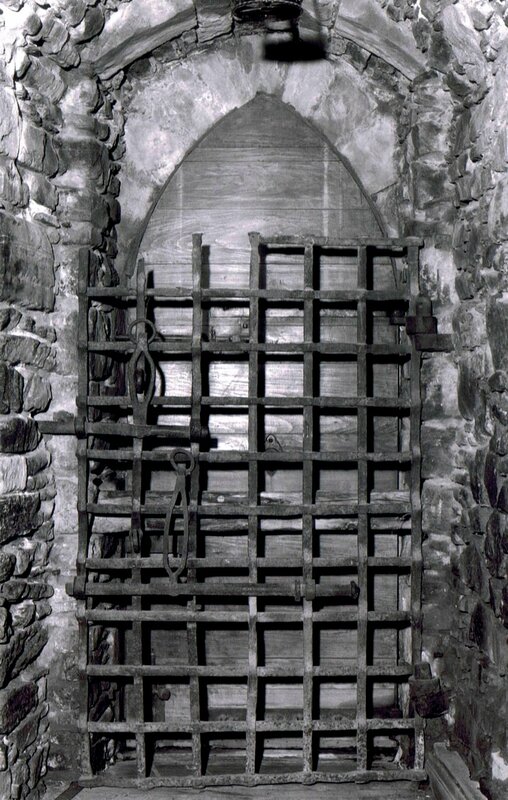 A yett is a gate or grille of latticed iron bars used for defensive purposes in castles and tower houses, and are predominantly found only in Scotland. Earliest references to yetts date from around the 14th century and a royal warrant was required before one could be installed in any abode. They were used as a cheaper alternative to the portcullis since it was simpler in concept, less cumbersome and more practical. They had the obvious advantage of being fireproof and were almost impossible to dismantle due to their “through and through” construction, and presented a formidable barrier to unwelcome guests, whilst still retaining the facility to fire arrows or muskets through the gaps at any invading party. The sole entrance to the medieval castle of Eilean Donan was through a gap in the Great Well bastion, where the Yett would have originally hung. When James I came to the throne in 1603 one of his first acts was to order the removal and destruction of all yetts across the land, symbolically beating them into ploughshares. Not being the easiest of things to dispose of, our yett was thrown into the well where it lay undisturbed until its discovery in 1893 when the well was dredged by Sir Kenneth Matheson. He later presented it to Lt Col John MacRae-Gilstrap who had it hung in the external entrance to the new Banqueting Hall. Today there are only a few remaining examples of yetts across the country, and it always amuses me that so many people pass ours without so much as a 2nd glance. This wonderful piece of history is over 600 years old, and is a testament to the craftsmen and blacksmiths of the time. Next time you visit, just have a wee look. Scotland is steeped in culture, history and heritage, a real appeal for visitors and tourists to our country. Castles are a hugely important part of this heritage and people flock to their ramparts every year. The only problem is, that we have over 2000 castles spread over the land, and the difficult choice for many visitors is deciding which ones to visit. Even as a lover of these wonderful great edifices myself; when I’m touring different parts of Scotland there are only so many I can visit before I reach saturation point. One of the most frequently asked questions we get at the Visitor Centre is about what other Castles or Monuments people should go and visit. It’s an almost impossible question to answer given the scale of choice. Many foreign visitors may have a maximum of two weeks to explore as much of Scotland as they can manage, and the usual circuit that people follow is no great secret. So what should they visit? Now I do also believe that there are other Historic Monuments and sites that are worthy of inclusion in this list, but I didn’t make the video, and we’re all entitled to our opinion, but what others would you add yourselves? 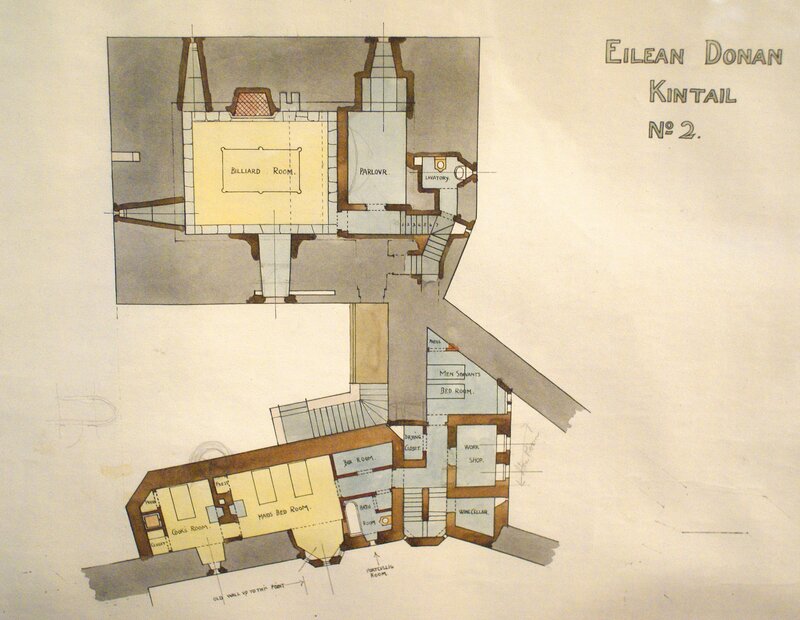 On a fairly regular basis I am asked about the building plans of the castle during the reconstruction period between 1912 and 1932. Last week I received an e-mail from Iain Anderson from the Royal Commission on the Ancient and Historical Monuments of Scotland (RCAHMS) asking for the same thing. 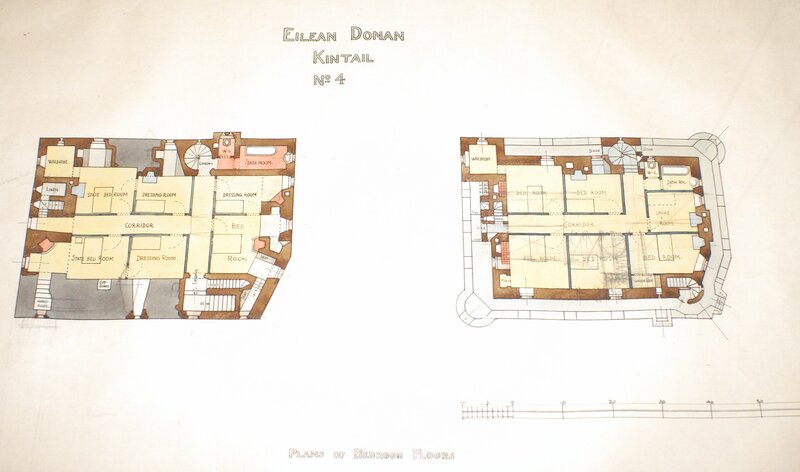 Unfortunately we can find little or no trace of the original building plans that Lt. Col John MacRae-Gilstrap and his Clerk of Works Farquhar MacRae used during the re-building process. I have a strong suspicion that no-one has ever made a conserted effort to track them down, so this winter I’m going to do my Sherlock Holmes impersonation and try and locate them. There are some clues I can follow up, and it would be amazing to finally locate them! 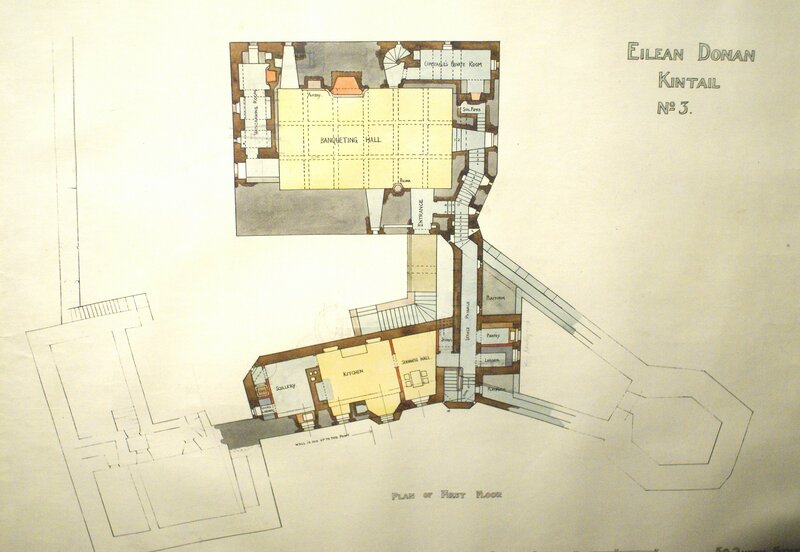 About 4 years ago however I did have a bit of luck when I uncovered, by sheer accident, 6 beautiful watercolours of plans that had been used in the design discussions. They had been rolled up, forgotten about and had lain gathering dust for nearly 90 years since their conception back in 1918. Considering their neglect they were all in remarkably good condition, and as such I had some conservation work done on them and had them framed. They are now displayed in the Billeting Room of the castle and are currently the only record of plans that have been found to date. Given how frequently we are asked for copies of them, I took some photographs this morning, in situ, so I could share them with yourselves and RCAHMS. The photography is a little crude, but at this juncture I’m very reluctant to use any flash in the process, and the lighting conditions in the Billeting Room are not great. I’ll re-do the photography come the winter when I start my search in earnest, but for the time-being they’ll give you a little taster. 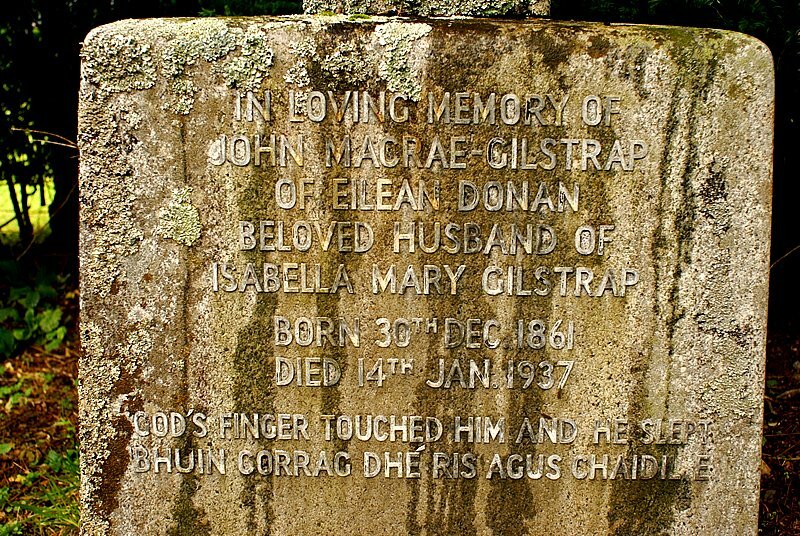 Much is known of the considerable achievements of Lt Col John MacRae-Gilstrap, the man ultimately responsible for the reconstruction of Eilean Donan, however as the old saying goes, “behind every good man there’s a good woman”, and the MacRae family is no different. Isabella Gilstrap, John’s wife was a formidable woman and her role in Eilean Donan, her charity work, her war effort and her other various activities are often over-looked. I’m personally a huge admirer of this diminutive lady, and take every opportunity to make people more aware of her work. 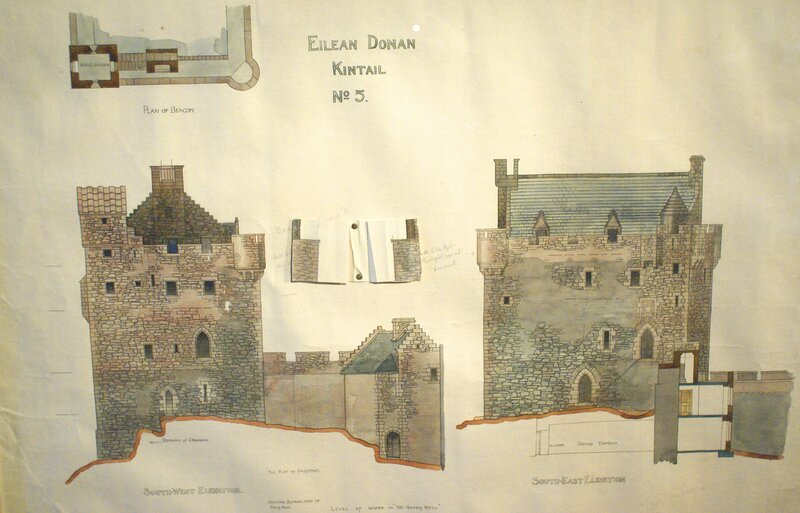 She kept scrapbooks that have provided us with truly fascinating detail of castle life in the early 20th century, and without her financial contribution, Eilean Donan may still be lying in ruins to this very day. Last week, we came across a superbly well preserved copy of “The Scottish Field” magazine from January 1921 and excerpts from the four page article provide a fascinating insight to Isabella. The following paragraphs are lifted directly from the magazine. “From the very moment that she was introduced to Scottish life, Mrs MacRae-Gilstrap conceived an almost perfervid love of for the country of her adoption, for its traditions and people, for its magnificent scenery, and the romantic setting of her Lochfyneside and Ross-shire homes. No one is prouder than she of the Celt and his history, and noone is more thoroughly imbued with the love of the clandom and all that clandom represents. 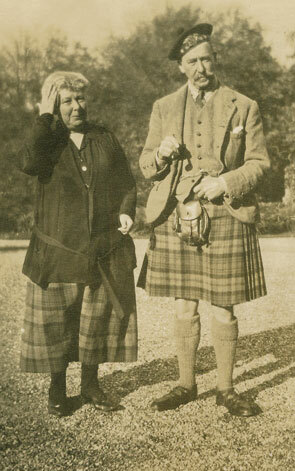 From the beginning of the war she has been constantly engaged in various activities connected with the great struggle, her attention being specially engrossed with the provision of comforts for Highland soldiers. She has been the means of raising sufficient funds to present the British Red Cross Society with three motor ambulances, handsome subscriptions received from all parts of the world. She has also kept a very complete roll of honour with respect to the Clan MacRae. This roll shows that about 3000 members of the clan answered the call of King & Country, and that over 430 have made the supreme sacrifice. In the fullness of time, I’ll share some of the detailed information from her glorious scrapbooks with you, and give you a greater insight of this wonderful lady. Gone but never forgotten……..
Modern Technology, what do you think? An affair of the heart.